The Happy Hippie Homemaker: How Involving My Kid Saves My Sanity! How Involving My Kid Saves My Sanity! One thing I've learned as a mother of a toddler (who's now almost a preschooler! ), it can be near impossible to get anything done if she's not occupied or sleeping! So I figure I have two choices: find something for her to do that will keep her entertained and occupied while I complete my task, or involve her in what I'm doing. True, the task will probably take a little longer to complete if the little one is involved, but I'll probably have fewer interruptions than if she's not. True, there may be more mess to clean up when we're done, but she'd probably be off in another room making a mess if she weren't working with me. Of course the greatest benefit of involving your kids in your projects is the opportunity to bond with them and teach them. You can teach math skills, like matching and sorting when assembling furniture and folding laundry. One of our favorite activities to do together is baking. I think this, in itself, is an important skill for children to learn, but it also gives parents the opportunity to teach children math (counting, fractions, addition, multiplication, etc.) I almost always modify recipes (doubling the yield or reducing the fat or sugar content), so I'm always doing math when I'm baking! At this point, learning fractions and multiplication are a little advanced for my little one, but I hope it's something she learns naturally and easily. For now, we're just working on counting and addition! Beat together butter, oil, and sugars until creamy. Add baking soda, cinnamon, salt, and flour; beat well. Stir in oats and raisins; mix well. (I usually stir in half of the oats and raisins, then stir in the rest to make sure all the oats and raisins get well distributed.). Drop by rounded tablespoonfuls onto ungreased baking sheet. Oh, it's so true! There's so much to learn when they're involved along with you — although I'm always having to teach myself patience in the moment, to enjoy the process even though it takes seven times longer and derails four times along the way. :) I need to try those cookies, now! So much fun when everyone is involved and how true about there being a mess either way! Your pictures are adorable - love the furniture assembly one! thanks for sharing and for the recipe!! Ok, it's no fair to tempt the pregnant mama with "amazing oatmeal raisin cookie" recipes - you know I'm going to have to make this right.now., don't you?! I agree with everything you've said though - everyday chores can be such fun, and great learning experiences! So so true! At 13 months, it's hard to involve Baby in some things, but I keep trying. Oh these photos are so awesome! I love the furniture assembly pic! I think maybe I need to bake more, maybe. I like that with that, the ingredients aren't hot. You put them together, THEN heat them. Sasha loves to help me cook! I have also found that the best way for me to complete a task when my toddler is around is to involve him. I love baking, but haven't done much since he was born :(. You've inspired me to give it a try, math 'lessons' and all! I love doing projects with kids - baking is one of our favorites, too. I think the time & mess are a small price to pay for the connection, involvement, and opportunity for practical learning. And I'm hoping we'll manage to keep these connections as they get older, as a way of reconnecting when they're more outwardly focused teenagers (gasp!). Baking is super fun with toddlers. Totaly chaotic mess sometimes but so worth it. Glad to see you love to do that together too! I love your photos reflecting how your lil one is engaged. And the cookie sounds yummy, will try it out. Wife to Marco. Mama to Gigi and Emi Lou. Spreading my love of babywearing, breastfeeding, natural-birthing, and all things attachment parenting everywhere I go! 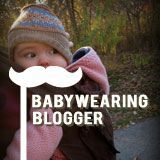 Wordless Wednesday: Babywearing Flash Mob! Human Milk 4 Human Babies!